Correct primary staging is mandatory for therapy selection and to determine prognosis in prostate cancer patients. Commonly used diagnostic procedures including Computed Tomography (CT), Magnetic Resonance Imaging, Choline Positron Emission Tomography/Computed Tomography (PET/CT) and extended lymph node dissection (ePLND) have suboptimal diagnostic accuracy for primary staging. PSMA targeting radiopharmaceuticals have shown better diagnostic accuracy than commonly used imaging procedures. This study presents data of a retrospective cohort of patients that received PET/CT with 18F-DCFPyL for staging of primary prostate cancer. From November 2016 until April 1018 all consecutive patients that received 18F-DCFPyL PET/CT for primary staging of prostate cancer were included in the study. 18F-DCFPyL PET findings in the primary tumour were scored. Detection rates of metastases were calculated for different clinical parameters, including PSA, Gleason score, clinical T-stage and risk on having lymph node metastases according to established prediction models. Subsequently, for lymph nodes, 18F-DCFPyL PET findings were compared to morphological features on the co-registered contrast enhanced CT and, for patients with risk on lymph node metastases > 5% according to prediction models, it was scored whether 18F-DCFPyL positive lymph nodes were present at locations that would be resected during ePLND, as well as presence of positive nodes or other metastases outside this area. One hundred thirty-three patients were analysed. Increased 18F-DCFPyL uptake the in primary tumour was found in 98% of the patients. In 69 patients increased 18F-DCFPyL uptake was found in lymph nodes, of which 48 and 45% had unsuspicious morphological characteristics on CT (size cut-off ≤6 mm short axis), for locoregional and distant nodes, respectively. In 43% of patients 18F-DCFPyL PET/CT detected lesions suspicious for metastases outside the ePLND area. 18F-DCFPyL PET/CT detection rates are in line with established prediction models of risk on lymph node metastases. 18F-DCFPyL PET/CT shows more lymph nodes with pathological characteristics as compared to the co-registered contrast enhanced CT alone. 18F-DCFPyL PET/CT detects lesions suspicious for metastases outside the ePLND area in 43% of patients, with risk on lymph node metastases exceeding 5%, which therefore may be excluded for ePLND. 18F-DCFPyL PET/CT detection rates are in line with established prediction models of risk on lymph node metastases. Large prospective trials that compare 18F-DCFPyL findings with histopathological findings after ePLND are needed in order elucidate sensitivity of 18F-DCFPyL PET/CT and to position 18F-DCFPyL PET/CT in the staging algorithm for primary prostate cancer. Primary staging of prostate cancer remains challenging, while correct staging is mandatory for optimal therapy selection and to determine prognosis. Generally prostate cancer spreads to lymph nodes and/or bone before other tissues are affected and therefore screening for metastases at primary staging is primarily focussed at detection of bone and lymph node metastases. According to recent European Association of Urology (EAU) prostate cancer guidelines metastatic screening is recommended for intermediate and high risk prostate cancer, including at least cross-sectional abdominopelvic imaging and 99mTc-phosphonate bone scan (Mottet et al. 2017). Different cross-sectional imaging options are available for screening for lymph node metastases, of which abdominopelvic Computed Tomography (CT) and T1-T2-weighted Magnetic Resonance Imaging (MRI) are most commonly used. Assessment of nodal invasion is done by using of the short axis lymph node diameter and morphology. However there is a significant overlap in size of metastatic and non-metastatic lymph nodes and the best cut-off value remains a matter of debate. As a result the sensitivity of CT and MRI is around 40% with specificities around 80% (Hovels et al. 2008; Harisinghani et al. 2003). 11C-choline or 18F-fluorocholine Positron Emission Tomography/Computed Tomography (Choline PET/CT) provides functional characterisation in addition to morphological characterisation and could therefore overcome the limitations of CT and MRI. Reported sensitivities and specificities for 11C-choline or 18F-fluorocholine PET/CT are around 50 and 95%, respectively (Evangelista et al. 2013; Mapelli and Picchio 2015). Due to limited diagnostic accuracy of abovementioned imaging modalities extended Pelvic Lymph Node Dissection (ePLND) is still considered the most accurate procedure for staging of lymph node metastases (Fossati et al. 2017). According to the EAU guidelines ePLND is recommended when risk on lymph node metastasis, as calculated by established prediction models, exceeds 5% (Mottet et al. 2017). Although considered most accurate, also ePLND has suboptimal diagnostic characteristics. Several studies have reported a considerable percentage of positive nodes outside the dissected area, even when no metastases are found in ePLND specimens (Jeschke et al. 2005; Brenot-Rossi et al. 2005; Heidenreich et al. 2002). Furthermore, this invasive procedure is accompanied by significant morbidity while presence of any therapeutic effect is still doubtful (Fossati et al. 2017). PET/CT with radiopharmaceuticals that target the Prostate Specific Membrane Antigen (PSMA) is increasingly used for imaging of prostate cancer. PSMA is a transmembrane protein that has 100 to 1000 fold higher expression at membranes of prostate cancer cells as compared to normal prostate cells and expression is higher in dedifferentiated tumours (Sokoloff et al. 2000). Initially PSMA PET/CT replaced Choline PET/CT for detection and localisation of lesions responsible for a biochemical recurrence after previous therapies with curative intent. Given the reported higher accuracy, including both better sensitivity and specificity of PSMA targeted radiopharmaceuticals in comparison to Choline PET/CT (Afshar-Oromieh et al. 2014; Bluemel et al. 2016), PET/CT with PSMA targeted radiopharmaceuticals may also play a role in primary staging of prostate cancer. At present 68Ga-HEDB-CC (68Ga-PSMA) is the most extensively studied PSMA targeting radiopharmaceutical in literature and also most widely used in clinical practice. However, the role of 18F-labelled PSMA targeted radiopharmaceuticals is evolving as a result of theoretically favourable imaging characteristics and the possibility to produce relatively large amounts of those tracers in cyclotron facilities (Sanchez-Crespo 2013). Clinical data on PSMA targeted PET/CT for primary staging is relatively scarce, especially for 18F-labelled PSMA targeting radiopharmaceuticals. Therefore, in this study data is presented of a retrospective cohort of patients that received PET/CT with 18F-DCFPyL, a promising 18F-labelled PSMA targeting radiopharmaceutical (Szabo et al. 2015), for staging of primary prostate cancer. In order to position 18F-DCFPyL PET/CT between commonly used diagnostic procedures and prediction models we studied different aspects of 18F-DCFPyL PET/CT. 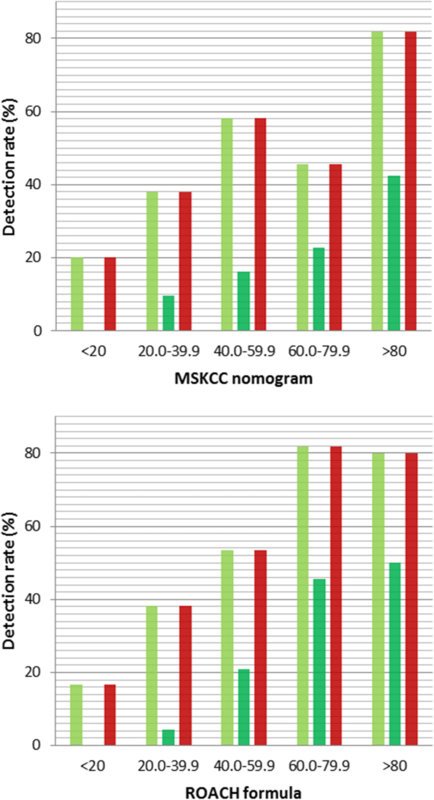 First we report the detection rates of 18F-DCFPyL at different anatomical localisations and for different categories of serum PSA-values, Gleason-score, T-stage and risk on having lymph node metastases according to established prediction models. Second, functional characterisation of lymph nodes according to increased 18F-DCFPyL uptake is compared to morphological features of those lymph nodes on the co-registered contrast enhanced CT in order to indicate additional value of 18F-DCFPyL PET/CT. Third, it is reported for patients with risk on lymph node metastases > 5% according to prediction models, whether 18F-DCFPyL positive lymph nodes were present at locations that would be resected during ePLND, as well as presence of positive nodes or other metastases outside this area. Finally, the possible clinical impact, which may be derived from the presented data, of 18F-DCFPyL PET/CT as a diagnostic procedure in primary staging of prostate cancer is discussed. From 16 November 2016 till 13 April 2018 all consecutive patients that received 18F-DCFPyL PET/CT for primary staging of prostate cancer at our department were included in the study. Exclusion criteria included: history of known other malignancy except basal cell skin cancer, deviation of the standard 18F-DCFPyL acquisition protocol and use of androgen deprivation therapy. The study passed the local scientific board and approval of the local ethical committee for the present study was waived since the study does not fall within the scope of the Dutch Medical Research Involving Human Subjects Act (section 1.b WMO, 26th February 1998). Furthermore, as a standard procedure on our department, all included patients gave written consent for usage of their anonymous data for scientific purposes. Besides the standard 18F-DCFPyL PET/CT no additional measurements or actions affecting the patient were performed. 18F-DCFPyL was produced and synthesized by an on-site cyclotron facility. One hundred and twenty minutes post injection of 18F-DCFPyL, PET images were acquired on a Siemens Biograph-16 TruePoint PET/CT (Siemens Healthcare, Knoxville, U.S.). Images were acquired from the inguinal region to the base of the skull (5 min per bed position). Data was reconstructed using an iterative OSEM-3D algorithm; 4 iterations, 16 subsets and 5 mm Gaussian filter. Image matrix size was 256 × 256, pixel spacing 2.67 × 2.67 mm and slice thickness 4 mm. For attenuation correction a radiocontrast enhanced CT (110 mAs at 110–130 kV) was typically acquired. Collimation was 16 × 1.2 mm, pitch 0.95, slice thickness 4 mm and matrix size 512 × 512. This resulted in voxel sizes of 1.37 × 1.37 mm for CT images for attenuation correction and 0.98 × 0.98 mm for diagnostic CT images. Baseline data of all patients including age, initial PSA, Gleason-score, and cTNM-stage prior to 18F-DCFPyL PET/CT, other imaging prior to 18F-DCFPyL PET/CT (within 6 weeks), dosage of 18F-DCFPyL and use of androgen deprivation therapy was prospectively entered in a database. The risk on having lymph node metastases was calculated using the Memorial Sloan Kettering Cancer Center (MSKCC) nomograms (https://www.mskcc.org/nomograms/prostate/pre_op) and the ROACH formula (Roach et al. 1994). Lesions suspected for prostate cancer were scored at different anatomical locations, including: prostate, seminal vesicles, locoregional lymph nodes (N1 according to the Prostate Cancer Staging of the American Joint Committee on Cancer, 7th edition), distant lymph nodes (M1a), bone lesions (M1b), other distant metastases (M1c). For 18F-DCFPyL positive lymph nodes the short axis diameter of the smallest and largest lymph node per anatomical location was measured on the co-registered diagnostic contrast enhanced CT. Thereby for CT the criterion of a short axis diameter of > 6 mm was used for malignancy. Additionally, it was scored by an experienced Nuclear Medicine Physician in association with an Urologist experienced in radical prostatectomy (M.W. and T.R. ), whether 18F-DCFPyL positive lymph nodes were present at locations that would be resected during ePLND, as well as presence of positive nodes outside this area. Nodes in the ePLND area included nodes adjacent to external iliac artery and vein, nodes within the obturator fossa located cranially and caudally to the obturator nerve, nodes medial and lateral to the internal iliac artery and common iliac lymph nodes at least up to the ureteric crossing. A total of 134 patients were included in the study. One patient was excluded because the 18F-DCFPyL PET/CT was acquired at a deviant time point. The patients’ characteristics of the evaluated 133 patients are presented in Table 1. 18F-DCFPyL PET/CT showed increased uptake in the prostate in 131 patients (97.8%). One patient without increased 18F-DCFPyL uptake in the prostate was diagnosed with Gleason 6 prostate cancer by transurethral resection of prostate tissue, the PET/CT showed increased 18F-DCFPyL uptake in a seminal vesicle suspicious for prostate cancer localisation. The other patient with a 18F-DCFPyL negative prostate had a Gleason 7 adenocarcinoma of the prostate at needle biopsy and a needle biopsy proven left iliac lymph node metastasis of 37 mm short axis diameter, which was also negative on 18F-DCFPyL PET/CT (Broos et al. 2018). Increased uptake in seminal vesicles was seen in 51 patients (38.1%). Increased 18F-DCFPyL uptake was found in locoregional and distant lymph nodes in 69 (51.5%) and 29 patients (21.6%), respectively. Nine patients (6.7%) had suspected lymph node metastases in the mediastinum and 7 (5.2%) had positive Virchow nodes. Thirty-six/133 patients (26.9%) showed evidence of bone metastases, of which 11 (8.3%) had diffuse skeletal disease. Suspicion on metastases in other organs was raised in 7 patients, of which 6 had suspicion of lung metastases and 1 patient had positive lesions in the penile bulb and corpora cavernosa suggestive for metastases (Fig. 1). Detection rates of 18F-DCFPyL PET/CT in relation to PSA, Gleason score, clinical T-stage and risk on lymph node metastases according to MSKCC nomograms and ROACH formula are presented in Figs. 2 and 3. In comparison with morphological characteristics on contrast enhanced CT, in 61/69 patients (98.4%) with evidence of locoregional lymph node metastases increased 18F-DCFPyL uptake was found in at least one locoregional node with a short axis diameter of ≤6 mm, while in 33/69 of those patients (47.8%) all locoregional node with increased 18F-DCFPyL had a short axis diameter of ≤6 mm. Twenty-six/29 patients (89.7%) had 18F-DCFPyL positive distant nodes with a short axis of ≤6 mm, while for 13 of those patients (44.8%) the largest suspicious node did not exceed 6 mm (Table 2). In only one patient an enlarged lymph node on contrast enhanced CT was found without increased 18F-DCFPyL uptake. This case is already discussed in a former paragraph (Broos et al. 2018). All but one patient in the cohort had a chance exceeding 5% on having lymph node metastases according to MSKCC nomograms and ROACH formula. Therefore for 132 patients it was scored whether 18F-DCFPyL positive lymph nodes were present at locations that would be resected during ePLND; as well as presence of positive nodes or metastases outside this area. Forty-one/132 patients (31.1%) had evidence of lymph node metastases only (N1 or M1a according to TNM 7th edition). Of those 41 patients 36 (87.9%) had positive nodes in the ePLND area, of which 15 (36.6%) had also positive nodes outside the ePLND area. Suspected lymph nodes outside the ePLND area included nodes in the pelvis (prevesical lymph nodes in 4 patients, mesorectal lymph nodes in 7 patients and nodes dorsally from the psoas muscle in 2 patients) and distant lymph nodes in 9 patients. Five/41 patients (12.2%) had only positive nodes outside the ePLND area, all mesorectally localised. Thirty-seven patients/132 (28.0%) showed evidence of distant metastases other than lymph nodes metastases (M1b or M1c). Fifty-four/132 patients (40.1%) had no evidence of any metastasis on 18F-DCFPyL PET/CT (N0 M0). For 95 patients (71.4%) 18F-DCFPyL PET/CT was the first imaging procedure used for staging purposes. In the other 38 patients, other imaging modalities for staging were used prior to 18F-DCFPyL PET/CT, including 22 99mTc-HDP bone scans (18 SPECT/CT), 7 18F-NaF PET/CTs and 9 T1-T2 weighted MRIs of pelvis and spine. Of the bone scans and 18F-NaF PET/CTs respectively, 17 and 3 were negative and 5 and 4 showed equivocal findings, none were positive. In 2 and 1 patients enlarged lymph nodes were encountered on SPECT/CT and 18F-NaF PET/CT, respectively. MRI showed signs of bone metastases in 1 patient and in 3 patients equivocal findings were encountered. In 1 patient, enlarged lymph nodes were found with MRI. In 17 patients with negative bone scans, 18F-DCFPyL detected 3 bone metastases in 1 patient and in 5 patients with equivocal findings bone metastases were detected in 2 patients, respectively 1 and 38 metastases. In 1 patient with equivocal findings on 18F-NaF PET/CT, 6 bone metastases were detected with 18F-DCFPyL PET/CT, while no bone metastases were detected with 18F-DCFPyL PET/CT in the other 6 patients previously scanned with 18F-NaF. 18F-DCFPyL PET/CT showed no bone metastases in 1 patient with suspicion on diffuse bone disease on MRI. All 3 equivocal MRI findings were negative on 18F-DCFPyL PET/CT. In 1/4 patients with negative bone findings on MRI, 18F-DCFPyL PET/CT showed 2 bone metastases. In all 4 patients with enlarged lymph nodes on MRI or the CT accompanying bone scan or 18F-NaF PET, lymph node metastases were found with 18F-DCFPyL PET/CT. Out of 30 patients without enlarged nodes on imaging before 18F-DCFPyL PET/CT, 16 patients had positive nodes on 18F-DCFPyL PET/CT. Additionally 3 patients received imaging for other purposes within 6 weeks prior to 18F-DCFPyL. In 2 patients that received CT, 18F-DCFPyL PET/CT showed bone metastases, which were only seen on CT in 1 patient. No lymph node metastases were found in those patients. In 1 patient lymph node metastases on 18F-FDG PET/CT were confirmed by 18F-DCFPyL PET/CT, which additionally showed a bone metastasis. There is very limited data on the value of 18F-DCFPyL PET/CT in primary staging of prostate cancer in present literature. 18F-DCFPyL PET/CT has been intra-individually compared with 18F-PSMA-1007 for primary staging in a pilot study in 12 prostate cancer patients (Giesel et al. 2017). Imaging with both tracers resulted in identical clinical findings. No histopathological confirmation of metastases is reported in this study. To our knowledge no other data is present in literature on 18F-DCFPyL PET in primary staging, therefor this study is the first to present data of a large cohort (> 100 patients) in the setting of primary staging. Also for other 18F-labbeld PSMA targeting radiopharmaceuticals there is no data present on its role in newly diagnosed prostate cancer. For 68Ga labelled PSMA targeting radiopharmaceuticals, a recent systematic review focussing on primary staging of prostate cancer shows a substantial variation in methodology and outcomes amongst studies. However it is concluded that the ability of 68Ga-PSMA PET to detect malignant lesions is evident across studies, with most studies demonstrating increased detection rates with respect to conventional imaging modalities (Corfield et al. 2018). All but two studies included a limited number of up to 30 patients. A study by Maurer et al. included 130 patients with intermediate to high risk prostate cancer staged with 68Ga-PSMA PET/CT or PET/MRI and compared PET findings for lymph nodes with morphological findings on CT or MRI with histopathological evaluation as the standard of reference (Maurer et al. 2016). In 119 (91.6%) patients increased uptake in the primary tumour was found. Increased tracer uptake was found in lymph nodes in 28 patients (21.5%). Compared to histopathology 68Ga-PSMA-PET detected 27 of 41 patients with histologically proven lymph node metastases while 1 of 89 patients without metastatic disease in lymph node was positive on 68Ga-PSMA PET. As a result sensitivity and specificity of 68Ga-PSMA PET for lymph node metastases was 66 and 99%, respectively. The other large cohort study by Uprimny et al. included 90 patients, which received 68Ga-PSMA PET/CT for primary staging (Uprimny et al. 2017). Eighty-two patients (91.1%) demonstrated pathologic tracer accumulation in the primary tumour, 24 patients (26.7%) lymph nodes with pathologic tracer accumulation consistent with metastases were detected and 11 patients (12.2%) revealed lesions suspicious for bone metastases. The relatively high detection rate of the primary tumour in studies with 68Ga-PSMA is in line with the results of the present study. However, in the present study metastases in lymph nodes and bone marrow were detected more frequently compared to the studies using 68Ga-PSMA. This can possibly be explained by the relatively higher PSA at time of PET/CT in the present cohort (median PSA 25.0 ng/ml) in contrast to the studies using 68Ga-PSMA (median PSA respectively 9.7 and 11.5 ng/ml). The 68Ga-PSMA studies did not present detection rates for different PSA categories and therefore a fair comparison cannot be made. According to morphological imaging (contrast enhanced CT), the presented data show that 18F-DCFPyL PET/CT is superior to morphological criteria found on the co-registered contrast enhanced CT alone, which is in agreement with findings with 68Ga-PSMA PET/CT (Corfield et al. 2018). Locoregional lymph node and distant lymph node metastases were detected with 18F-DCFPyL PET/CT in 33 and 13 patients, respectively, without lymph nodes > 6 mm in these areas on CT. According to ePLND, 57/133 of the patients (43.2%) with risk on lymph node metastases exceeding 5%, had evidence of metastasised disease outside the ePLND area. Twenty of those patients had lymph node metastases only. Patients with metastases outside the ePLND area will not benefit from ePLND and can be excluded for this procedure by 18F-DCFPyL PET/CT. Twenty-one patients (15.9%) had evidence of lymph node metastases in the ePLND area only. It could be speculated that those patients might benefit from ePLND. Another 54 patients (40.9%) showed no evidence of metastases at all, given the generally moderate sensitivity found in studies with 68Ga-PSMA (Maurer et al. 2016; Budaus et al. 2016; van Leeuwen et al. 2017; Rahbar et al. 2016), this category of patients may also benefit from ePLND. Although, the sensitivity of 18F-DCFPyL in this patient category remains unknown, which emphasizes the need of histopathological confirmed studies with 18F-DCFPyL PET/CT. In comparison to established prediction models of risk on lymph node metastases, detection of lymph node metastases with 18F-DCFPyL PET/CT shows great similarities. In comparison to MSKCC nomograms, 18F-DCFPyL only finds a lower number of patients with lymph node metastases (45.5%) in the category with a risk between 60.0 and 79.9%. While in comparison with the ROACH formula, 18F-DCFPyL PET/CT detected at least as much patients with lymph node metastases as predicted in all categories. Those prediction models are based on lymph node dissection templates (Roach 3rd et al. 1994). Therefore the similarities found between those prediction models and 18F-DCFPyL PET/CT detection rates suggest a good sensitivity of 18F-DCFPyL PET/CT, which may suggest that 18F-DCFPyL PET/CT can be used to deselect patients for ePLND if no lymph node metastases are found with 18F-DCFPyL PET/CT, which would be in contrast to the relatively low sensitivity found for 68Ga-PSMA PET/CT. Therefore this finding warrants large prospective trials that compare 18F-DCFPyL findings with histopathological findings after ePLND in order to position 18F-DCFPyL PET/CT in the staging algorithm for primary prostate cancer. Since there is a significant overlap in size of metastatic and non-metastatic lymph nodes the best cut-off value remains a matter of debate. In literature it can be found that a short-axis diameter larger than 6 mm on CT images of patients with prostate cancer, results in specificity for the detection of a malignant nodes of 97% (Oyen et al. 1994). If the threshold is changed to a short-axis diameter larger than 5 mm for metastases (in pelvic malignancies), the specificity drops to 78% (McMahon et al. 2010). Therefore in this study a cut-off value of larger than 6 mm was used for determination of malignant nodes on CT. Although this cohort shows heterogeneity regarding some aspects, it is representative for the clinical practice in hospitals that treat large numbers of patients with prostate cancer. As an example of heterogeneity this cohort includes 38 patients that received other imaging studies for prostate cancer staging prior to 18F-DCFPyL PET/CT, which may introduce bias in the cohort. Most of those prior studies had equivocal or negative results for metastases, especially for bone metastases. The pre-test likelihood of presence of metastases in these patients is probably lower than in patients without any prior imaging study, which is supported by the fact that bone metastases were found in 18.5% of patients that had prior imaging procedures and in 29.2% of patients without prior imaging. Therefore, it is likely that the detection rates of 18F-DCFPyL PET/CT in a non-biased cohort will be at least as high as found in the present cohort. Another limitation of the present study is the lack of histopathological confirmation of the suspected metastases on 18F-DCFPyL PET/CT, which is a consequence of the retrospective nature of the study and loss to follow-up of patients, which were referred for 18F-DCFPyL PET/CT by other hospitals. However, other PSMA targeting radiopharmaceuticals, of which those labelled with 68Ga are most extensively studied, show generally high specificities and positive predictive values both exceeding 90% (Maurer et al. 2016; Budaus et al. 2016; van Leeuwen et al. 2017; Rahbar et al. 2016; Afshar-Oromieh et al. 2015). Therefore lesions with increased 18F-DCFPyL, which fit in the pattern of metastatic spread of prostate cancer, should be considered as highly suggestive of prostate cancer. MW Protocol/project development, Data collection or management, Data analysis Manuscript writing. FvdZ Protocol/project development, Data collection and management, Manuscript editing. TR Protocol/project development, Data collecting and analysis, Manuscript editing. SS Data collection, Manuscript editing. MK Data collection, Manuscript editing. AD Data collection, Manuscript editing. VF Data collection, Manuscript editing. RK Protocol/project development, Data collection, Manuscript editing. All authors read and approved the final manuscript. All procedures performed in studies involving human participants were in accordance with the ethical standards of the institutional and/or national research committee and with the 1964 Helsinki declaration and its later amendments or comparable ethical standards. The study passed the local scientific board and approval of the local ethical committee for the present study was waived since the study does not fall within the scope of the Dutch Medical Research Involving Human Subjects Act (section 1.b WMO, 26th February 1998). As a result the need for informed consent was waived for this retrospective study.